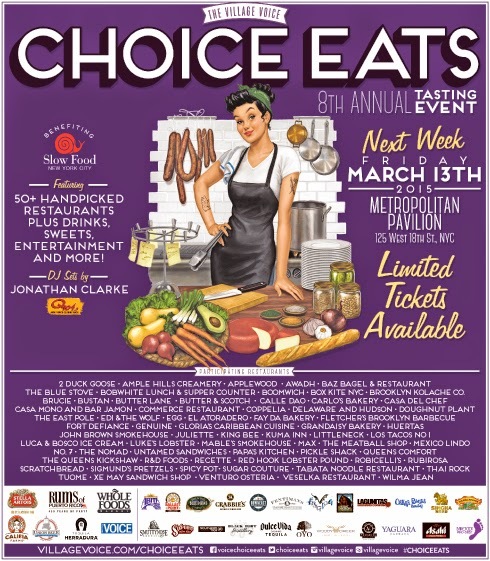 The Village Voice 8th Annual Choice Eats Tasting Event is almost here! This year's event will feature 50+ handpicked restaurants from all five New York City boroughs on Friday, March 13th at Metropolitan Pavilion. Guests will sample the best dishes from restaurants reviewed and heralded in the Village Voice along with complimentary craft beer pairings, wine and liquor beverages. Our resident food critics have scoured New York's culinary landscape and combined their tastiest picks from their several years of unearthing the five boroughs’ best-kept secrets. Every March, Choice Eats attracts a very diverse group of New Yorkers who come to feast on cuisines from over 35 nations, including Vietnamese, Italian, Uzbekistani, Brazilian, Cambodian, Russian, Tunisian, Greek and Cajun/Creole among many others. Choice Eats stands out as a food event that highlights the hidden gems of New York City's diverse culinary landscape. Some past restaurants who have participated include Momofuku Milk Bar, Kuma Inn, The Meatball Shop, Luke's Lobster, Peppa's Jerk Chicken, Ovelia Psistaria, Del Posto, Tiffin Wallah, Jimmy's No. 43, Fletcher's BBQ and many more.